I will let Trisha take over and tell you all about how her design works. My comments are in [these boxy things] and a critique at the bottom. My cousin and her husband are a young family with 2 small girls. They moved into their new house with a yard so big, I don’t think they know what to do with it. The yard’s layout and plain concrete patio are built along stark, straight lines. I began softening the lines with an addition to the patio. The [patio] extension would be lined in brick and could be flagstone set in mortar. I designed it to be the same height as the patio (opinions are welcomed if it would be better ground height, stepping down off the patio). [Definitely keep it the same height Trisha – it will be much safer and nicer to use]. I set a swing on this extra patio for her and her husband to sit on and watch the girls play. If flagstone is too expensive, the addition could be switched to a planting bed. The brick edge should stay to hold that line in place. Her yard is currently is one huge L shape. In order to break up the space, I incorporated one of Rachel’s infamous circle lawns. I have never seen a circle lawn and I think my cousins jaw will drop when she sees it. I love Rachel’s use of curved paths, so I used one around the lawn to tour the yard. This is a pretty big path that takes up a lot of space. It would be nice set in pavers, but since our highway department will deliver free woodchips, that might be a no brainer. The lawn would need a strong brick edge if using woodchips, and I think square stepping stones (that I lifted from one of Rachel’s designs) would be a nice touch set in the path. Theres a nice stop along the path with a wooden bench under her big pine tree. After the circle lawn was established, there was room for 2 more areas. A playground was the obvious choice. And seeing that the other part of the lawn hides behind the garage, I assume they want the girls to stay in this area where they can see them. The final section of the yard behind the garage, I thought, would be great for ‘family getaways’. So I added a firepit and left the grass so they could put up a tent and go camping! These 4 sections of the yard would be fantastic for parties. The adults could play ‘bags’ in the lawn and have a bonfire, and the kids could play in the playground. My cousin likes to eat healthy food, so I gave her not 1 but 2 vegetable garden areas, if she chooses to grow vegetables. I imagine her and her girls eating from the fruit tree and raspberry bushes by the patio. I also gave her the option to grow greens and herbs on the patio, with large box patio planters. And situated a few more terra cotta planters on the extended patio. I’m so very proud of my first real garden design. Its all because of Rachel’s insane ability to teach the right information in the right way. She’s such an inspiration. Thank you Rachel! [:D Grinning from ear to ear – thank you Trisha, you are very welcome, I LOVE that you’ve taken so much on board from just the Garden Design Shows]. Trisha certainly should be very proud of her first ever design. She’s really understood how to divide the space up and create a nice flow around the garden. The area that needs a bit more work is by the shed. The firepit/camping area doesn’t flow in with the rest of the garden as nicely as it could. The other slight thing, and this is very nit-picky, is the play area. It would look better if it’s definitely smaller than the main lawn. If it’s the same size or larger, it throughs the balance off and makes the garden look top-heavy. Trisha has a really good eye for design and I cannot wait to see what she is able to do once she’s been through a full design course – she really will be unstoppable! Trisha has her own plant nursery called Roots Nursery which is in the western suburbs of Chicago. She’s got a lovely website and I recommend you take a look at the download pages she’s created as there’s some garden layouts you can download and adapt to your own garden. I’m so happy to see a horticulturist crossing the ‘plants only’ divide and embracing garden design so fully. 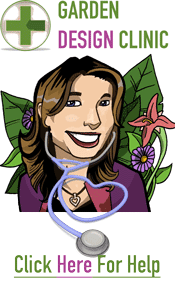 She’s planning on doing the various online garden design and planting courses we do here at Successful Garden Design so that she can better serve her customers. Has Trisha’s 1st garden design inspired you? Do leave your comments and feedback in the boxes below! Wow! Trisha, your design is so beautiful! I especially love the shape of the path tying 3 of the areas together and how you've dealt with a boxy element (the patio) to incorporate it into the organic feel of the design. Kuddos! Wow – that is really fantastic. I am very impressed.